VeloCittà is now seeking city partners to host ‘VeloCittà 2018′, the third VeloCittà Conference for Cities & Bike Share. This follows the successful first ‘VeloCittà 2016′ in Rotterdam and ‘VeloCittà 2017′ in Rome (see below). On November 16, 2017, VeloCittà, in conjunction with ISINNOVA , Velo Mondial and Comune di Roma, held its 2nd international conference on bike sharing ‘VeloCittà 2017′. 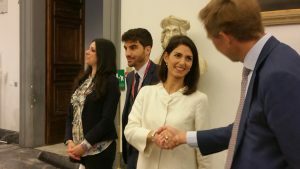 The event took place in the Protomoteca Room of the sixteenth-century Campidoglio, with more than 155 participants from 20 different countries. The day opened with welcome remarks from Virginia Raggi, Mayor of Rome, Joep Wijnands, Ambassador of the Netherlands in Italy, Enrico Stefàno, President of Rome’s Mobility Commission, Linda Meleo, Rome’s Mobility Councillor, and Mario Gualdi of ISINNOVA, after which an orange bike was presented to Mayor Raggi from Ambassador Wijnands. The Mayor of Paris’s 12thArrondissement and President of Autolib Vélib Métropole, Catherine Baratti-Elbaz, Chris Paul of Greater Manchester Mayor’s Cycling and Walking Team, and Paolo Gandolfi, a Member of the Italian Parliament, then spoke about their experiences and offered some input on what kind of policies and initiatives will make Rome a more cycling-friendly city. After lunch, other European experiences were presented by Silvia Jiménez Valenciano of the City of Barcelona and Florinda Boschetti of POLIS, the European Network of Cities. Then the bike share operators attending the event had a chance to talk about their systems, their networks, their business models and revenue streams. They discussed different ways to address bike sharing challenges, and showed how Rome could successfully implement a bike sharing programme that would include options such as geo-fencing, the favoured model of VeloCittà, and digital parking stations. The next hour was devoted to a series of round table discussions, where each operator had a chance to go around to several tables of 10-15 people each to explain their services and to answer any questions they had. This led to a number of lively discussions, particularly between competing operators, interrupted only so that the organisers could formally close the conference. The participants then continued comparing ideas about bike sharing as they made their way towards the exit, leaving their new Roman friends with a palpable sense of optimism about their city’s transport. All the presentations and pictures are available here. The pedal-assist bikes operated by Lyft-owned companies in New York City, San Francisco and Washington were removed based on concerns over the brakes. In recent months, dozens of riders have reported injuries while riding electric Citi Bikes, prompting the company on Sunday to pull all of the approximately 1,000 electric bicycles from New York City’s streets amid safety concerns about the brakes. 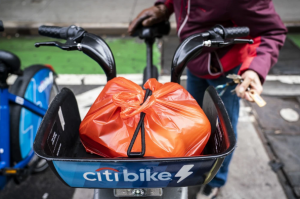 Lyft, which owns Citi Bike, took similar precautions with its other bike-sharing services in Washington and San Francisco. “We recently received a small number of reports from riders who experienced stronger than expected braking force on the front wheel,” the company said in a statement on its website. “Out of an abundance of caution, we are proactively removing the pedal-assist bikes from service for the time being. We know this is disappointing to the many people who love the current experience — but reliability and safety come first.” Read more here. Plusieurs opérateurs incitent ou obligent leurs usagers à déposer leur vélo dans des déplacements dédiés. Une façon de ne pas encombrer les trottoirs et de lutter contre le vandalisme. Côté pile : le free-floating offre une liberté totale à ses utilisateurs, qui peuvent déposer leur vélo où bon leur semble, contrairement au système Vélib' fonctionnant avec des stations. Côté face : les trottoirs des villes sont de plus en plus encombrés par les deux roues. Ce qui crée des crispations avec les piétons et agace les municipalités, soucieuses de garantir une forme d'harmonie dans l'espace public. 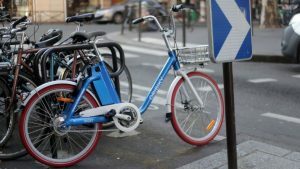 C'est pour répondre en partie à ce problème que plusieurs spécialistes du vélo en libre-service parient désormais sur le modèle du « semi free-floating ». Le dernier en date est Uber. Le géant américain des VTC lance jeudi son service de vélos et de trottinettes électriques (Jump) à Paris. Read more here.